Galapagos is one of the most incredible animal strongholds in the world today, but there is also much more to see. Campus Trekking offers an exclusive trekking on the Isabela Island where you will experience not only the spectacular volcanic scenery but also the flora and fauna such as the different endemic species of tortoises, sea lions, flamingos, herons and sharks. This adventure begins with a walk through the dry forest coastal area and a hike to the tear wall followed by a 3-day trek to the Sierra Negra volcano, whose crater is a huge collapsed area totally uninhabited by anything except lizards, finches, feral goats and donkeys which have made this area their home. The Sierra Negra crater is the second largest crater in the world (11km. diameter) after Ngorongoro in Tanzania. Much of the landscape of Sierra Negra is dominated by the spectacular active cone Cerro Chico and sulphur mines which also show amazing fumaroles and bizarre colours. From the highest point of the crater rim you can observe the superb scenery: In the south Volcano Azul, in the north the perry isthmus and the volcanoes Alcedo, Darwin, Wolf and Fernndina. This trek can be combined with a normal 4, 5 or 8-day Galápagos cruise, a hotel-yacht combination, a dive or multi activity program. Campus Trekking has its own base in Isabela Island with all the necessary equipment such as tents and camping gear to make a successful operation. Hike in the dry vegetation zone and in the humid area of Sierra Negra. Observation of the animal world. 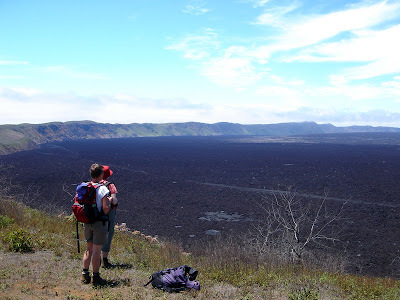 Visit 2 active cones in the Sierra Negra Volcano. Visit the second largest intact crater in the world. Personal equipment such as sleeping bag, trekking boots, rucksack, headlamp etc. Important note: This program is only organized for groups of min. 10 passengers. In case you are with less participants, we can offer an alternative itinerary.